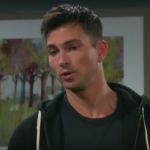 ‘Days of Our Lives’ spoilers relate a tense week up ahead in Salem, as Chloe Lane (Nadia Bjorlin) is held hostage, Ciara Brady (Victoria Konefal) is still missing, old relationships come to light, and confidentiality is broken. But first, let’s get you caught up with our daily Days of Our Lives recap. If you remember from Friday, Chloe found a bloody knife in her mail. She recognizes it as the one she used to kill drug lord El Fideo, and she’s freaking out hard-core. Stefan DiMera (Tyler Christopher) is there to calm her down and takes her phone to call the cops when she’s too shaky to do it. Before he can, two thugs come in with guns raised. They say they’re going to kill Chloe exactly they way she killed him. Stefan shows he’s not that bad of a guy by claiming Chloe as his in front of the would-be assassins, then claiming his father, Stefano DiMera, is alive and well, contrary to the rumors. He claims that if they harm her, his father will make them sorry and he’ll be right there with him. This works, somewhat. One of the would-be assassins is all “screw this” and takes off, quaking in fear at the DiMera name. The other one seems to smell the bluff from a mile away, saying he’ll stay and take his chances. He’s about to stab Chloe when Stefan jumps into action, stabbing him instead. We’re telling at him to take the freaking gun clearly visible in the guy’s pants (why do people do that? Seriously, they’re totally begging for an accident), but he doesn’t take the good advice. We see the guy pulling said gun just as Chloe yells to Stefan. Whether he’s hit or not, we’ll have to wait and see. ‘Days of Our Lives’ Spoilers: Daddy Dearest? John Black is still reeling from seeing his ex is the Diana Cooper (Judith Chapman) he’s been looking for. Like with her (she calls him Roman), he knew her under a different last name. The initials match, however, so he curses himself for not making the connection. Apparently that grainy photo wasn’t enough to tell who she was. Anyway, he makes the same pitch as everyone else has so far, and she is clearly so over it. John’s persistent, though, so he keeps on keeping on. It looks like he might possibly be making headway when Leo Stark (Greg Rikaart) enters the room. He demands to know what’s going on, and is shocked to learn his mother had a relationship with one of his adversaries. John leaves after letting Leo know he’s not the kind of guy to just give up, and if Leo has doubts about this, he should ask mom. Now alone, Leo demands to know what she may have shared. We’re thinking Mommy might be better served by practicing more of that tough love and selling him out, but what do we know? Later, John meets with Marlena Evans (Deidre Hall) and tells her who her so-called fan really is. He explains how she lied because she thought it would be better for Marlena. She’s surprised by all this and asks if he knew she had a son. He says no, and then Marlena points out that Leo must have been born not too long after Diana left Salem. Ciara Brady (Victoria Konefal) is still missing, and Hope Brady (Kristian Alfonso) has spent most of the episode badgering Marlena into breaking doctor-patient confidentiality. We tell her not to cave, but eventually, Marlena coughs up a few details about her session with Ben Weston (Robert Scott Wilson). Nothing half as damning as she could have said, but it’s enough. Also: Claire Brady (Olivia Rose Keegan) manages to get Tripp Dalton (Lucas Adams) to forgive her for her plot to break him and Ciara up.